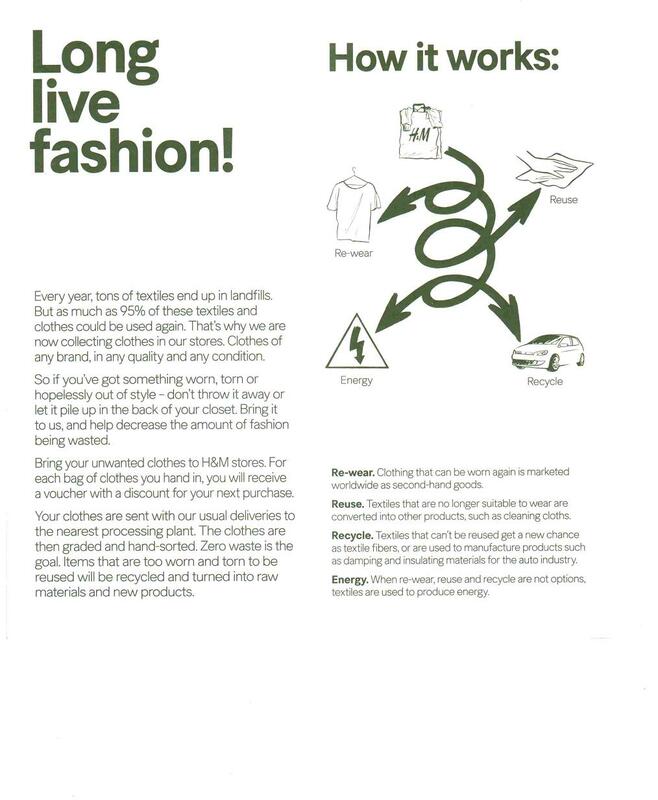 H&M Conscious Initiative / Donate Your Old Clothes! I’ve recently purged my closet to free up some space and I donated it all to the Toronto branch of the Saint Vincent De Paul Organization (Toronto branch through here and Ontario branch through here) that works to help the poor and homeless with the donated items. Growing up, I’ve never had a lot of expendable income and it’s only been recently at the ripe age of 25 that I’ve had more freedom to explore the more luxurious aspects of city life like stylish clothes and boutique cosmetics. Maybe it’s because I’ve grown up conserving, reusing and recyling a lot of materials, but I’ve realized that the fashion industry wastes a LOT of textiles and plastics from packaging and simply not being able to sell their products. The amount of wasted energy and produced pollution just from making the clothes that go into a single store must be staggering! Enter the H&M Conscious initiative. For every full bag of used clothes you bring back to any H&M location, you’ll get a $5 voucher for your next $30 or over purchase. They’ll take ANY brand, ANY condition and in ANY quality! They’re aiming for zero waste in their production cycle and I think it’s a worthy cause for a big box retailer like them! Admit it! You have a ton of clothes right now in your closet that you haven’t worn in a year but you simply can’t bear to toss them out because you kinda still like them and maybe, MAYBE they’ll come back in style in the future and MAYBE you’ll fit into that cute top you got a couple years ago if you can really stick to your diet and exercise regime this year! Gather up your old clothes and give it a second life! Donate them to a good cause whether it’s to H&M (find more info at hm.com/longlivefashion) or directly to your local shelter or homeless, in-need organization. Someone, something somewhere will be very grateful that you did. Note: I’m not paid by H&M or anyone to promote any organization or program. I just think it’s a great cause! Not related to your post but I love the balloons! Also, will be using this coupon… I have way too many clothes that I don’t wear… and it’s a good exchange for something that I’ll be more likely to wear (: Thanks for the heads up! Thanks Steph! I’ve been seeing some great stuff at H&M lately (like their A-line dresses!) so I’ll be heading there with a bag later too.